Ok, they didn’t actually fall from the sky but that would be a nice change of weather ^^; In fact, I’ve had these nendoroids for a couple months; I just haven’t gotten around to taking photos of them until now. And the reason for that is that I have a new camera :) Yep, I’m the proud owner of a Canon 40D. This is my first DSLR (that I didn’t borrow) so I’m still learning how to apply the various features of this powerful camera. Unfortunately, the following photos reveal my inexperience as I took them the day I received the camera >_< Ah, well.. I’ve actually learned quite a bit in the few days since then so hopefully my next photos will look better. 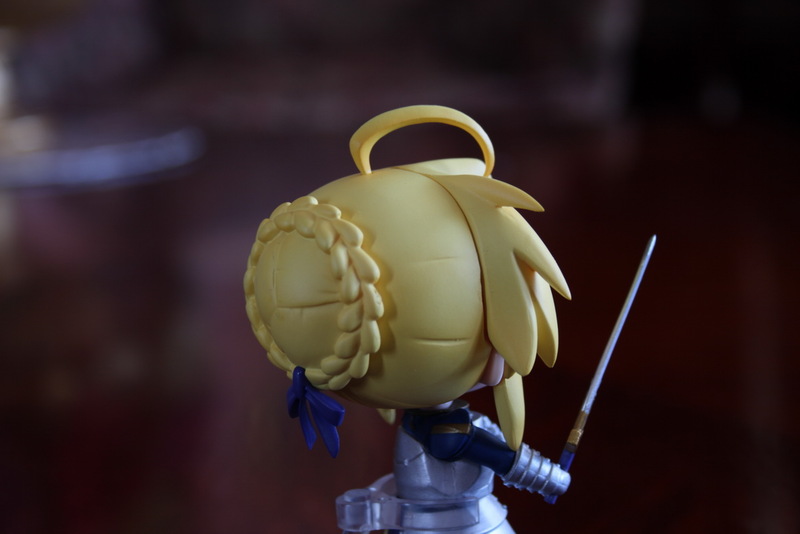 If anyone has expereience taking good photos of figures, I’d be interested in additional advice. Hit the jump for the photos. These are from the Lucky Star Petit (Puchi) Season 1 set. 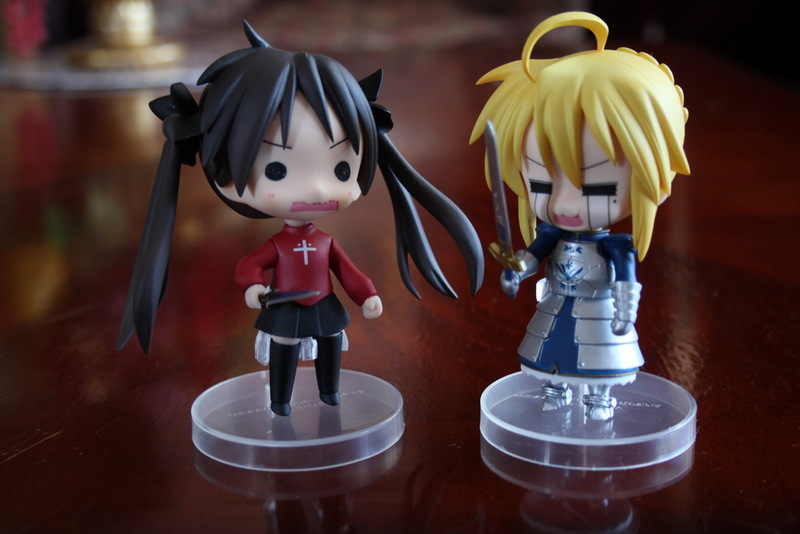 They’re kind of like normal Nendoroids except they’re much smaller. 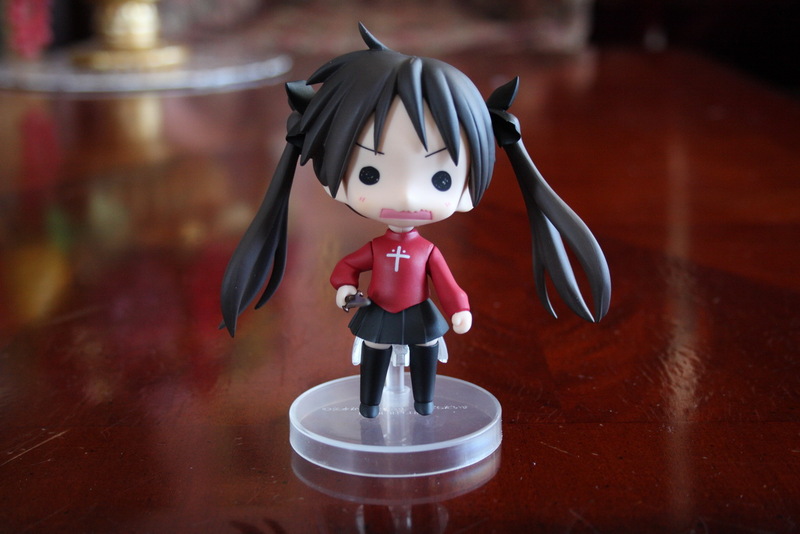 Surprisingly, they’re still configurable and posable with removable arms and faces. Also, they’re pretty good quality for their small size. 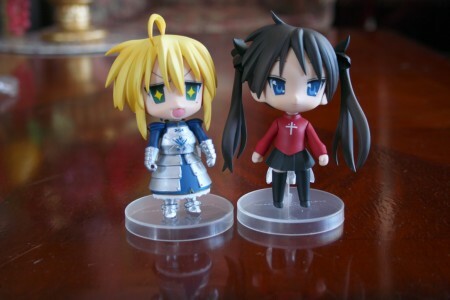 I guess you could say they’re super cute, miniaturized versions of their larger Nendoroid siblings. The four girls in their alternate outfites. Cheerleader uniform for Miyuki, summer seifuku for Tsukasa, Kagami in her miko hanabi/kimono, and Konota in her classic school mizugi. And now for some full-sized Nendoroids! These two are Fate cosplay set which features Konata as Saber and Kagami as Rin. Good quality figures here. 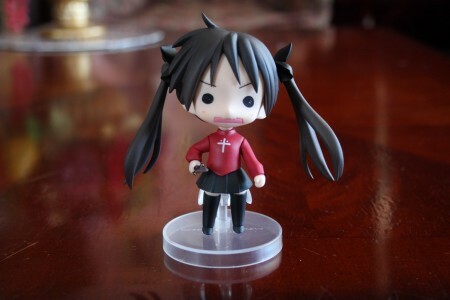 I think Nendoroids have been gradually increasing in build quality since their inception. At least that’s what I’ve seen with the few I own. 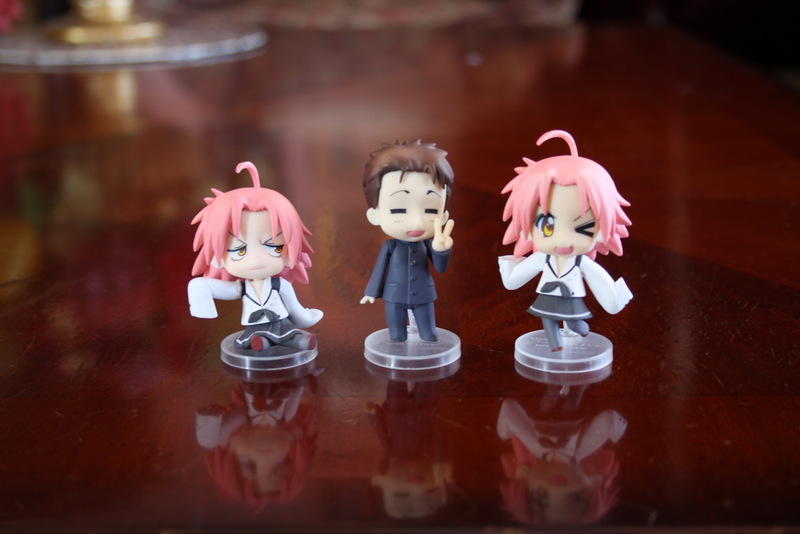 This set isn’t exactly new but it’s newer than my Comptiq Kagami and better quality. 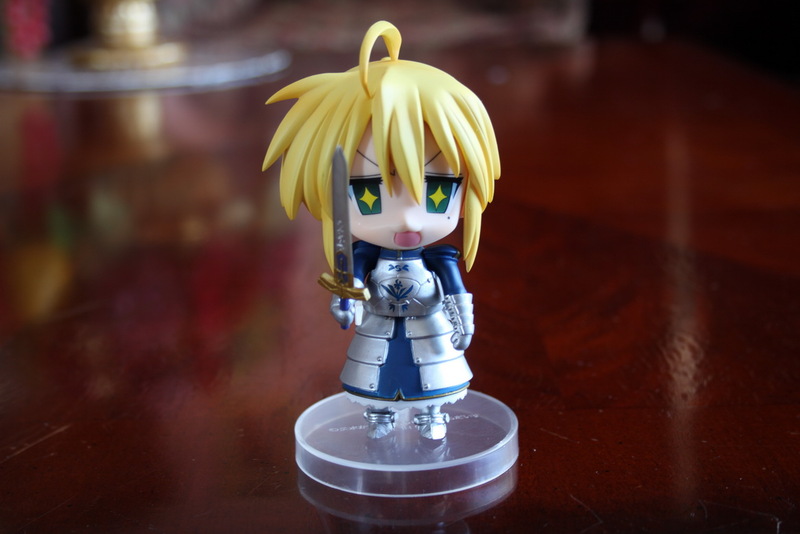 My Ink-tan Nendoroid is my newest and the best quality, I think. 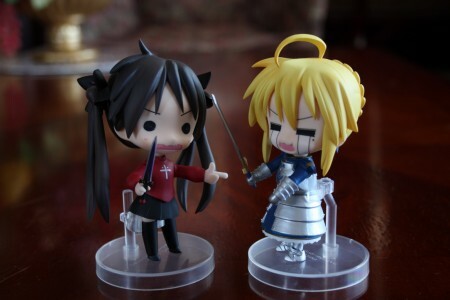 Both are wielding deadly weapons. 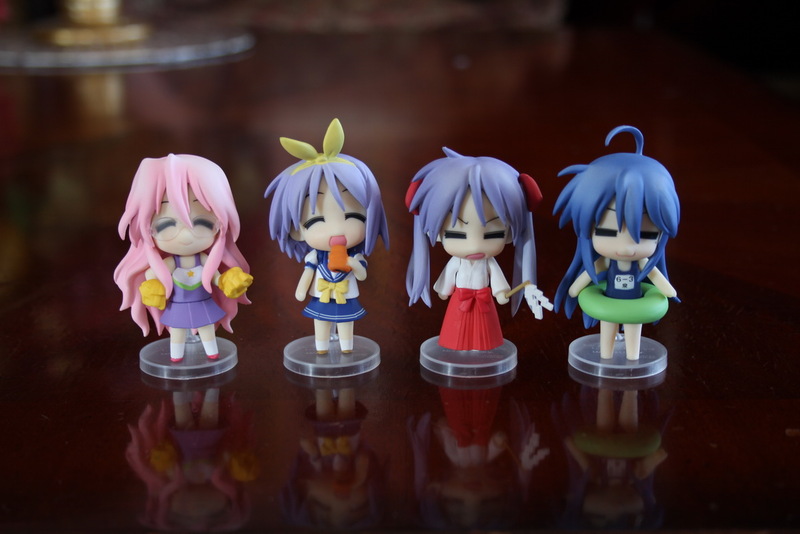 Konata even has Saber’s trademark hair bun and ribbon. 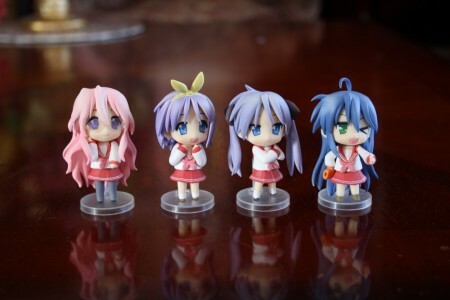 Konata’s sword is longer but I wouldn’t count Kagami out so quickly. That’s all for now, hope you enjoyed the photos! Tsukasa & Miyuki Nendoroids, Comptiq Ver. I love these pictures! You’re gonna be an excellent photographer from day one!